Today we finally left Toul and started the long meander to Paris. Our first day on the canals involved climbing from the Moselle Valley to the Meuse River. We worked through twenty locks and then, for good measure, an 800 meter tunnel. 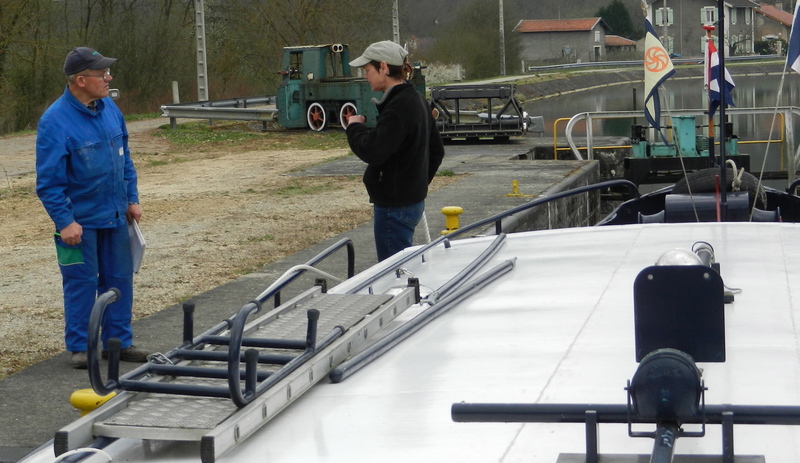 This was our introduction to handling the barge, and yet one more unsuccessful experience in our search for our first nasty person in France. 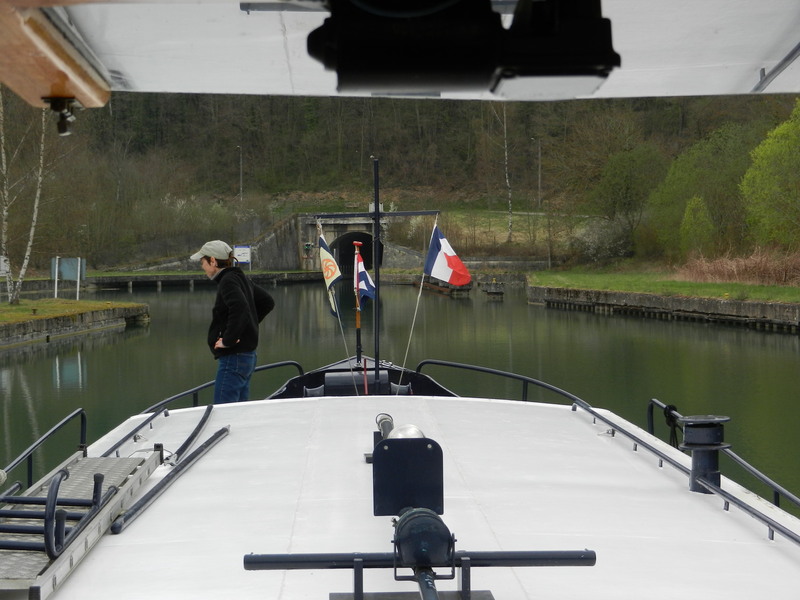 Passing through the dreaded first lock we met two workmen from VNF (Voie Navigables France, the French canal authority). As with all encounters French, this involved numerous bonjours, bon journeys, messieurs and madames and au revoirs, interlaced with rapid and indeciferable friendly French. Harvey, in his best Marcel Marceau French, said this was his “premier ecluse,” his first lock in his new batteau. Word passed rapidly on the VNF grapevine and by our third lock we’d acquired a friendly VNF guy in his VNF van who just happened to be driving from lock to lock all day at the same slow pace we were travelling. He just appeared at each lock when Sandra missed lasooing a bollard, just in time to place her loop where she intended. When Harvey couldn’t reach the lever to start the lock cycling, voila, it cycled anyway. By our twentieth lock of the day, our guaduan angel was still appearing to shepherd us through. Yet one more nasty French person, right. By afternoon, we’d passed through all twenty locks with a few bumps and scrapes to our 86-year-old barge, but with no visible scars. Then at the top of the whole flight of locks we faced an 800 meter tunnel through the hill separating the two valleys. We emerged onto the Meuse River, heading north toward historic World War One battlefields, Verdun, Sedan, the Ardennes, spending the night in the small village of Pagny-sur-Meuse. This town boasts of La Favorite, a favorite French truck stop. Truckers know their food so we stopped there, too. A Fench buffet and an endless “wine fountain” explained why the truckers were there, and they certainy were, with truck after truck pulling off the highway, log carriers, tankers and tractor trailers. All these truckers sat at long tables, whispering to one another as they filled and refilled pitchers of wine. It was so civilized, nonetheless, with all the tough truckers whispering, shaking hands as new truckers arrived and the ocassional kiss-kiss on the cheeks. A place not yet on the Rick Steeves tourist radar. All this followed yesterday’s encounter with French Immigration as we appeared for our medical exams and interviews for our long-stay visas. It was not quite Harvey’s great-grandparents experience at Ellis Island, at least for us. Had Sandra worn a burka or Harvey African robes, the experience surely would have been different. For us, alrhough we’d anticipated problems because we couldn’t prove our childhood vaccinations and we’d dreaded that some form would lack some mandatory stamp, the toughest part was the eye exam, not because we couldn’t read the eye chart but because we hadn’t memorized French names for the letters. “H” was “aish” and “Z” was “zed,” but “I” being “Ee” and “E” being “aye” was tricky. Nonetheless, we passed and moved on to the physcal, which was odd in that it wasn’t at all physical, the doctor never touched or examined us but just asked a few questions. Of Harvey he wanted to know wherther he’d “married a French girl.” Of Sandra he asked whether she smoked and she did not know the desired answer, this being France. By the end of the day we had new colorfully holographic visas in our passports allowing us to remain in France for one year, renewable annually. The key to getting the visas turned out to be our cell phone contract. If we were good enough for the phone company to accept as French residents, Immigration was satisfied. Over the next few weeks we’ll work our way up the Meuse River and canal and into the Ardennes, on a slow journey to Paris by June 1. Your own tour guide for the locks! You must be celebrities. Glad it went well for you. Can we go back to the wine fountain place when I come over? Congratulations you two! You will enjoy the Meuse. Verdun is an amazing and emotional experience. We are getting a late start this year and will be setting off on Armida in early May – if we can find some water to float on. Keep up the great attitude. Jen, the wine fountain … think of Ipswich House of Pizza when you order a soda and they hand you a cup and you walk to the machine that sprays Coke or Orange into your cup. Now think local French wine, but instead of a cup you have either a small or a large pitcher, and a truck driver behind you with a pitcher in each hand. I think I’m glad I’m not driving on French highways. I am enjoying following your trip, though we haven’t met and I’ve not seen the canals of France! Wonderful adventure and please keep posting. This is fabulous! I hope you will keep us posted so that we may live vicariously throughout your adventure! I am a friend of Linda Evans. She was kind enough to let me read your post. It all sounds wonderful. My wife and I gave up our search for the nasty frenchman/woman. We live in Philadelphia so the threshold is high. I hope to be able to follow your adventure. Boating through a tunnel. That gives new meaning to French Underground. We’re enjoying your blogs, and passing them along; keep ’em coming.